On Saturday I loaded Henry up and made the 4 hour round-trip trek to have a lesson with my former jumper trainer. I rode with him when he was based in Austin but now he’s in the Houston area (which has worked out really well for him, even if I’m pouty about it). I’ve lessoned with him on Henry before but it was about a year and a half ago. I went on to elaborate about the million and one things I can’t seem to do right on a consistent basis until finally he told me to just go canter the vertical back and forth to warm up. I didn’t mess that up, so we proceeded to courses. And honestly? It wasn’t bad. I still have those same habits that I can’t seem to ever stop doing (why do I soften my hands and shoulders when I see the long distance? Why do I hold onto my inside rein out of the turns?) and I still need a little help getting the right canter, but otherwise it was kind of decent. I think he even said “good” at one point. Much less of a shitshow than I usually feel like these days. After we were done I tossed Henry in a stall, unhooked my trailer, and made the short drive further towards Houston to the Great Southwest Equestrian Center to check out the Luxe EQ mobile trailer. I’m pretty familiar with most of what she carries but some of it I haven’t seen in person yet… it’s been about a year since I’ve been in there. The jackets are so nice. And fit so well. And are so classic. And you can customize them. And they can do navy with yellow piping and navy buttons. So, ya know… that happened. But it won’t be here til May so it doesn’t count. Next Exclusive Luxe EQ sale! Glad the lesson went well! I want one of those jackets… Need! I agree, you definitely need. I still need a Winston coat in hunter green, because they really are so beautiful. They really really are. I was super impressed. I want one of those coats in brown. With white piping. Want may not be strong enough of a word . . .
It’s kind of a thickish tech fabric. This one is a super lightweight stretch wool (still machine washable!). Way better fit, prettier navy, and should be more comfortable to wear in the heat. 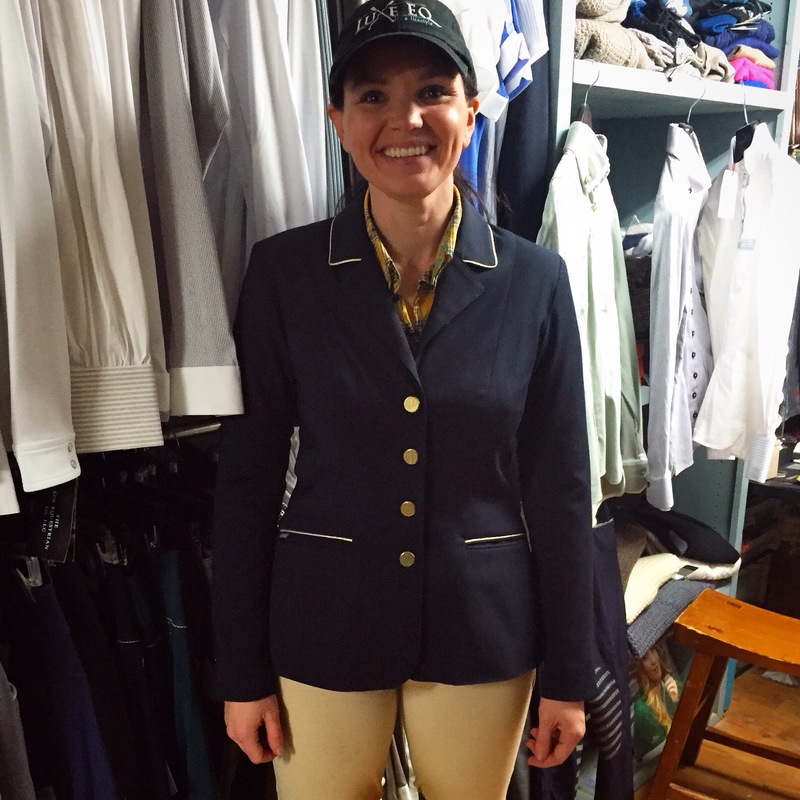 Does your fabulous new Winston jacket mean you’re selling your Horseware jacket? HMMMM. I haven’t been wearing a Horsewear for quite a awhile, I’ve been wearing an Equiline lol. Yeah after writing that I realised I actually had no idea if you still wore your Horsewear jacket. Brain failure. Basically I’m greedily still searching for a show coat that fits me properly SIGH. Will you keep the Equiline as a second coat? Yeah, probably. Maybe to use in the rain so I don’t get the “nice” one all gross? Does she take parts of soul as tender? The belts alone, swoon! Ha, good point! We’re not jumping much these days either. Whhhaaaattt?! Custom jacket with purple things on it? Maybe a grey custom jacket with purple things and purple belt? And Aztec Diamonds, of course. You could totally do that. And it would be amazing. Can’t wait to see the pretty new coat!! Actual quote from Mark when I asked him how your lesson went- “it was good.” Anyone that knows him knows this is major. I think he’s just lowered his standards for me since I’m an eventer now. How can I get one of those custom jackets? I loooove them. You can order through Luxe EQ! She has a facebook page, or you can email megan@luxe-eq.com and she’ll give you all the details. He was considerably less abused than he usually is. If you bought the Marta, thank you. I’ve been sitting here all day trying to figure out how the hell to justify ANOTHER coat, and a gray one at that. You’ll like it.